Venezuela is located in northern South America. It is bordered by the Caribbean Sea and the Atlantic Ocean, Colombia to the west and south, Brazil to the south, and Guyana to the east. 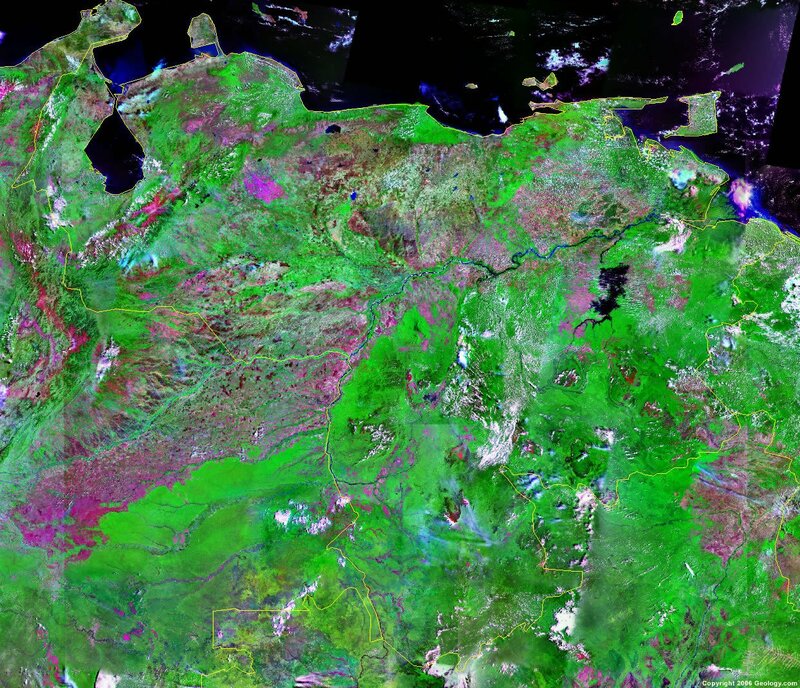 Google Earth is a free program from Google that allows you to explore satellite images showing the cities and landscapes of Venezuela and all of South America in fantastic detail. It works on your desktop computer, tablet, or mobile phone. The images in many areas are detailed enough that you can see houses, vehicles and even people on a city street. Google Earth is free and easy-to-use. Venezuela is one of nearly 200 countries illustrated on our Blue Ocean Laminated Map of the World. This map shows a combination of political and physical features. It includes country boundaries, major cities, major mountains in shaded relief, ocean depth in blue color gradient, along with many other features. This is a great map for students, schools, offices and anywhere that a nice map of the world is needed for education, display or decor. 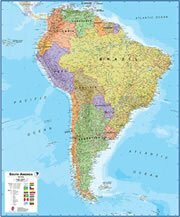 If you are interested in Venezuela and the geography of South America our large laminated map of South America might be just what you need. It is a large political map of South America that also shows many of the continent's physical features in color or shaded relief. Major lakes, rivers,cities, roads, country boundaries, coastlines and surrounding islands are all shown on the map. Baraquisimeto, Barcelona, Barinas, Barquisimeto, Bochinche, Cabimas, Cabruta, Calcara, Canaima, Caracas, Ciudad Bolivar, Ciudad Guayana, Ciudad Piar, Cumana, Curiapo, El Amparo, El Dorado, El Jobal, Esmeralda, Guanare, Guiria, La Asuncion, La Guaira, La Paragua, Lagunillas, Los Teques, Maracaibo, Maracay, Maturin, Mene Grande, Merida, Puerto Ayacucho, Puerto Carreno, Punto Fijo, Riecito, Rosario, San Carlos, San Cristobal, San Felipe, San Fernando de Atabapo, San Juan de Manapiare, Santa Elena de Uairen, Santa Rita, Tucupita, Tumeremo, Valencia and Valera. Arauca River, Atlantic Ocean, Boca Araguao, Boca Grande, Caribbean Sea, Caroni River, Embalse de Guarico, Embalse de Guri, Golfo de Venezuela Golfete de Coro, Gulf of Paria, Lago de Valencia, Laguna Mar Chiquita, Meta River, Orinoco River, Serpent's Mouth, Serra Parima, Serrania de Imataca, Sierra Pacaraima and Ventuari River. Mineral resources for Venezuela include iron ore, diamonds, gold, bauxite, as well as other minerals. In addition, there are fuel resources which include petroleum, natural gas and hydropower. Venezuela is subject to floods, mudslides, and rockslides. The country does experience other natural hazards, such as periodic droughts. Venezuela has urban and industrial pollution, especially along the Caribbean coast. The country's rainforest ecosystem is threatened by the irresponsible mining operations. Water issues for Venezuela include sewage pollution to Lago de Valencia; oil and urban pollution to Lago de Maracaibo. There is also deforestation, and soil degradation.